This post is sponsored by The Brand Connection/Pentel, all ideas and opinions are my own. I’m definitely a 90s kid. One of my greatest pleasures in school was writing in pretty colored inks. I just hated when they forced you to write in blue or black. I wanted purple, pink, or turquoise. But guess what? The pens we all loved are now back, only better! Pentel Pop pens now come in all kinds of amazing colors from pastels to sparkle ink and even neon colors! I’ve just stocked up and put a whole collection of colored pens on my desk. 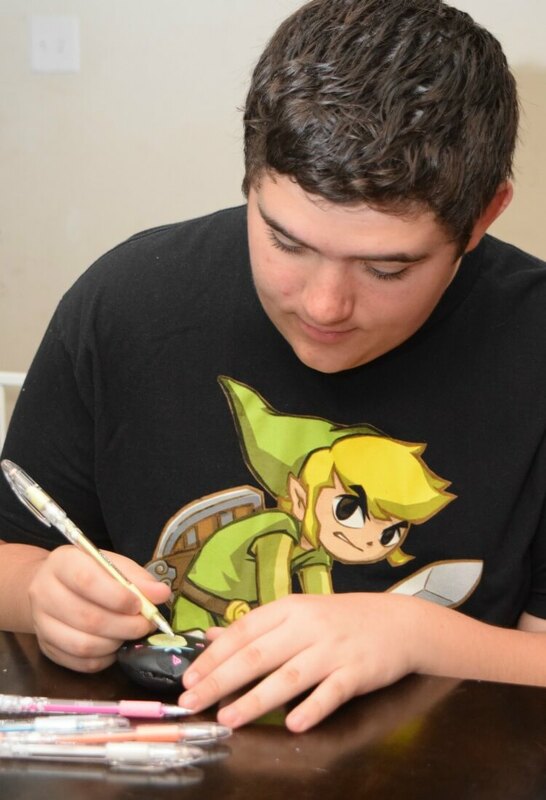 My kids love to create and craft, but often their go to activity is video games. 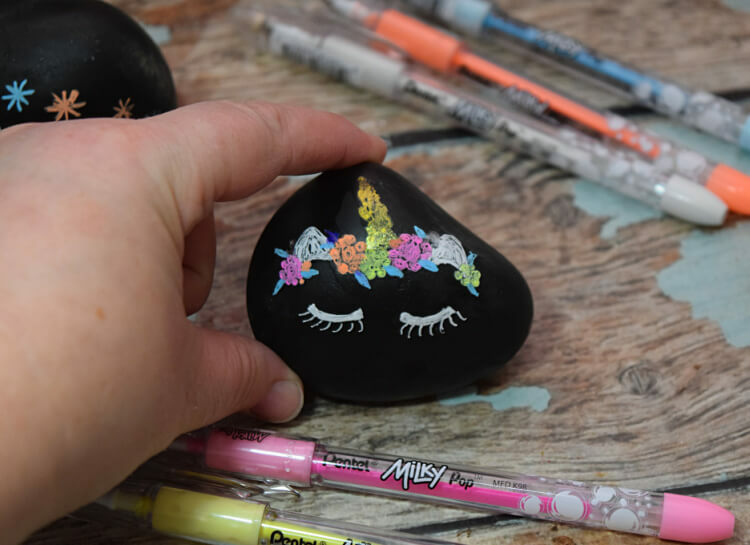 So, this past weekend, we got them off the computers and figured out how to create Rock Art with the new Pentel pens. You can find river rocks at your local craft store. You can get light and dark rocks. We chose dark river stones, and then I decided to make them even darker with a layer of black chalkboard paint. I spray painted our rocks the night before we created our rocks. We did a search online to check out various rock art from painted rocks to pen drawing rocks. Then, we just went to town and created different rock art from astronauts to pineapples. We live in a very small town — like so small, we have no traffic lights. However, we live right next to a big college town where people love to paint and hide rocks. 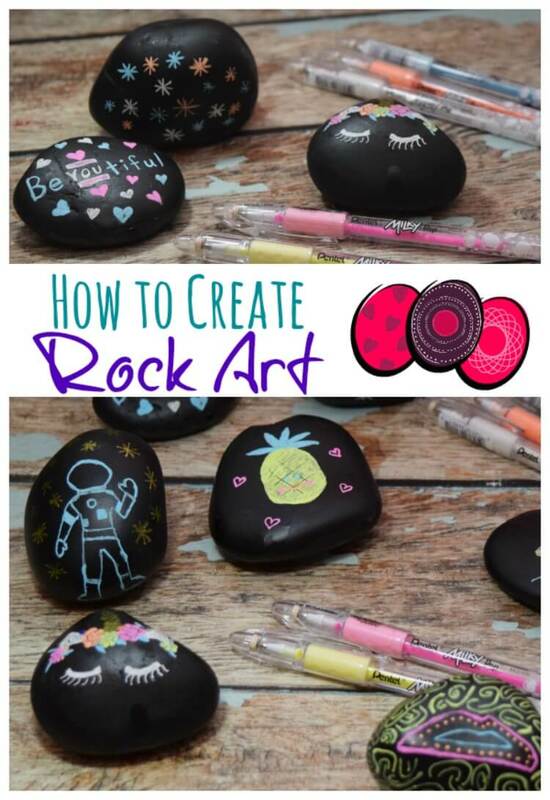 Even schools have gotten the kids in on it, and an entire class with create rock art and hide them. I thought it would be totally fun for us to hide them around our small town. So, we went out today and hid them all around the town – near the library, a bank, one of the schools, etc. Then, I took pictures with my phone and posted a collage on the Facebook group for our town. Hopefully, more people will get in on the fun. 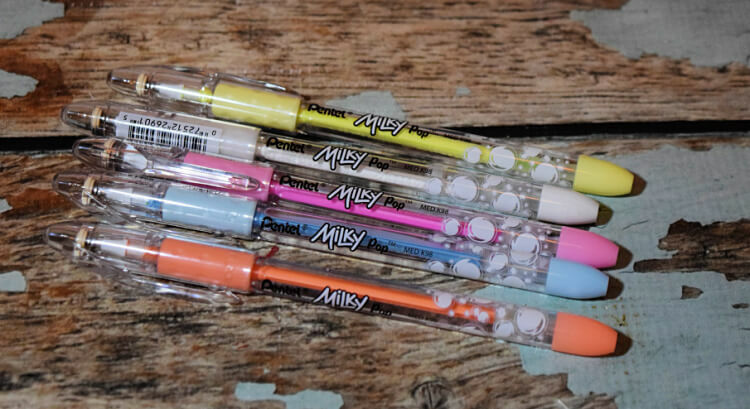 Pentel’s Milky pens are the original ones from the 90s. They’re back and the perfect way to add a “pop” of color with beautiful milky pastel colors. They have such a great smooth gel ink that can write on both light and dark colored paper, and they can write on photo paper. 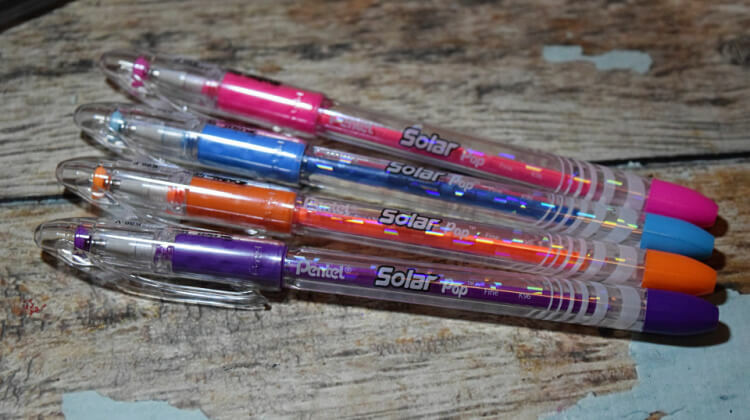 Pentel Solar gel pens are perfect to add vibrant neon color accents. They write in medium lines, so they’re great for getting that fine detail when drawing on a rock. 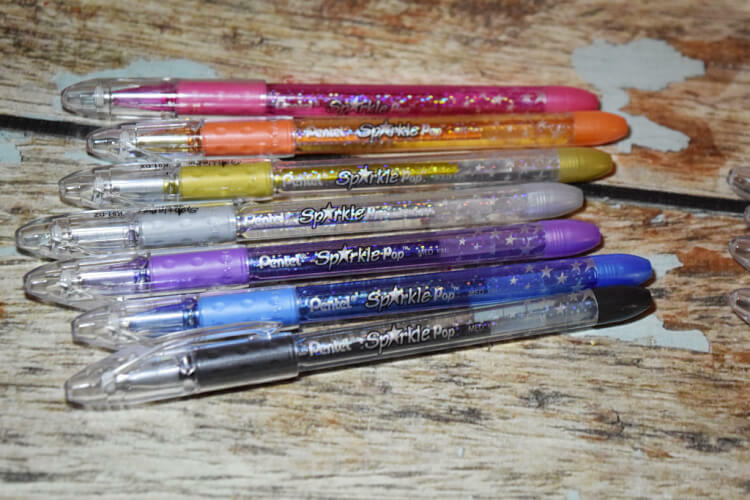 I love a little sparkle, so Pentel’s Sparkle pens are my absolute favorite. I love the milky pastels, but the sparkle pens are where I’m at. They are these beautiful iridescent magical ink colors that write on black, white, and even photo paper. They are perfect for so many things from accents on rocks to cards, drawing, and doodling, and so much more. Are you ready to get creative with Pentel? You can get even more inspiration with fun Pentel Pop crafts and ideas on the Pop by Pentel website! Don’t forget to follow Pentel on Instagram, Facebook, Twitter, and Pinterest to see their latest ideas! I love the idea of hiding them around town. Such a novel and cute way to enjoy a lovely day and pretty up your surroundings. Wow, love some of your rock art there. I have a hobby of collecting stones when I travel and after reading this post, it inspired me to make some rock arts from my stones collection. 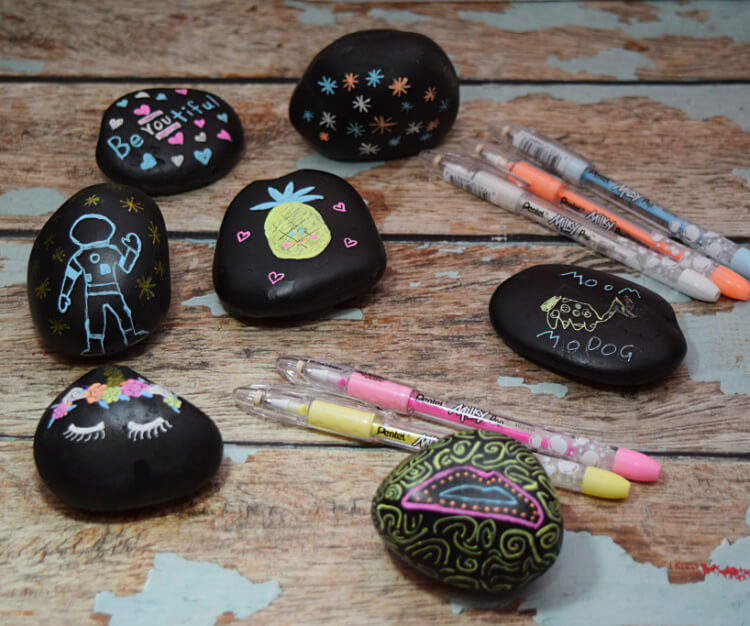 Rock art is one of our favourite things to do when crafting! Those Pentel pens look great for creating rock art, I’ll definitely be picking some up. That stuff really goes on nicely. These rocks look really awesome! My kids would love to do this, especially my daughter. She loves arts and crafts. 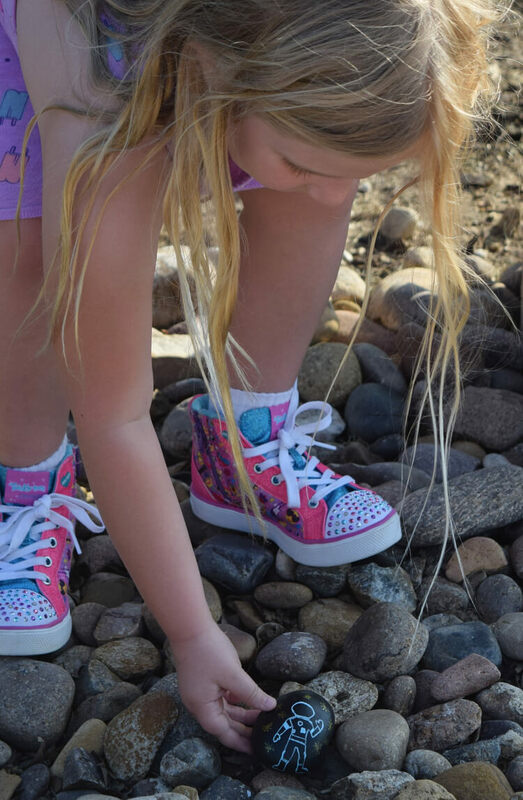 Our community leaves the decorated rocks around town and has a Facebook page to document which ones you’ve found. You can also see how discovered your creations. I hadn’t even thought of Pentel pens but that looks much better than paint! 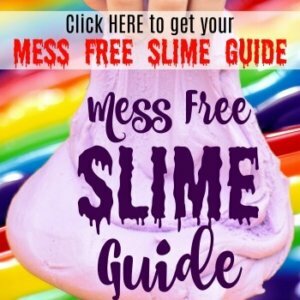 This would be such a fun project for the kids. I am definitely going to have to try this with mine! How fun! What a great little craft! I’m a bit of a gel pen junky myself so I’ll have to check these out! This is surely fun and creative! I would love to try this with my kids and write encouraging messages or cute arts. These are adorable. I never got into the trend of decorating rocks, but it’s a huge thing happening around here. 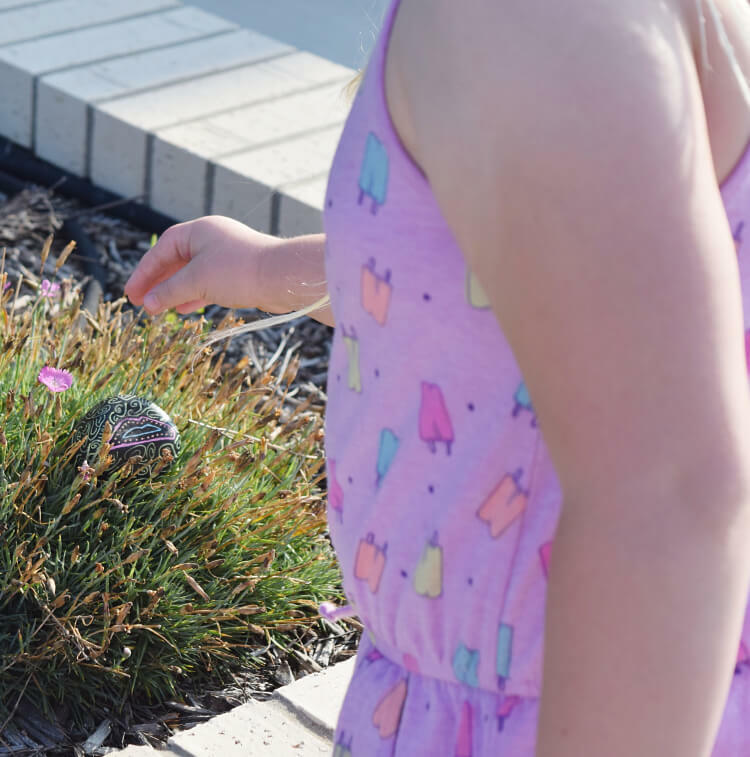 The kids love finding them. 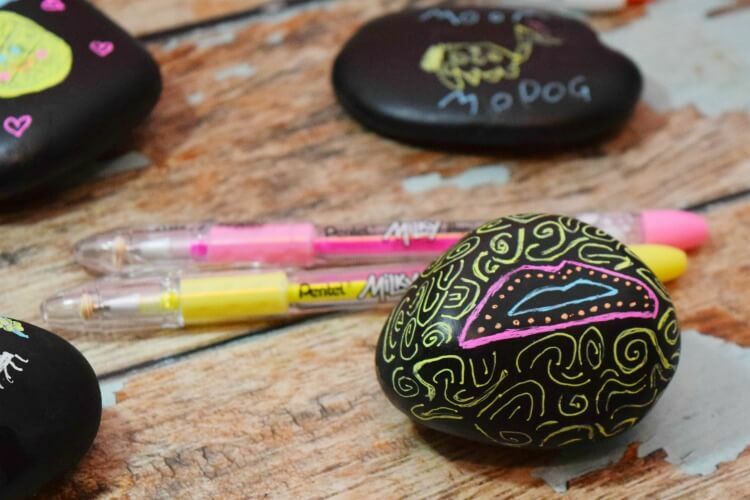 My boys love to paint rocks but we’ve never tried using pentel before, this is something we will have to try. I love the way the colors pop out! I have some similar sized river rocks I purchased at Home Depot. Next week we start our new homescool year and I think I’m going to have them make pet rocks for our classroom.